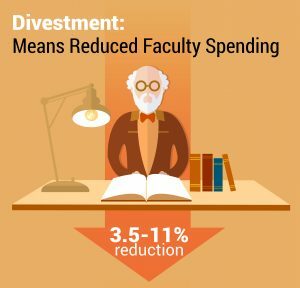 Six recent reports from experts from Arizona State University, Caltech and the University of Chicago Law School have looked into the costs of divestment at universities and the facts are in: Divestment is all cost and no gain. Colorado’s annual cost of divestment could range from $36 million for narrow divestment to $50 million for broad divestment. Over a 50-year timeframe, that cost skyrockets to between $470 billion under the narrow policy and $646 billion, or a 10.12 percent loss, under the broad policy. For New York’s $190 billion pension, the expected annual cost of divestment ranged from $136 million for narrow divestment to $198 million under the broad strategy. 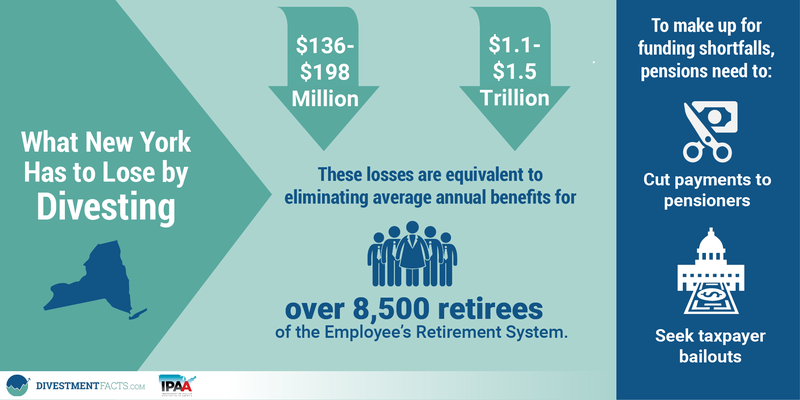 To put these numbers into perspective, the average pension for retirees in the Employee’s Retirement System (ERS) was $23,026 in FY 2017. 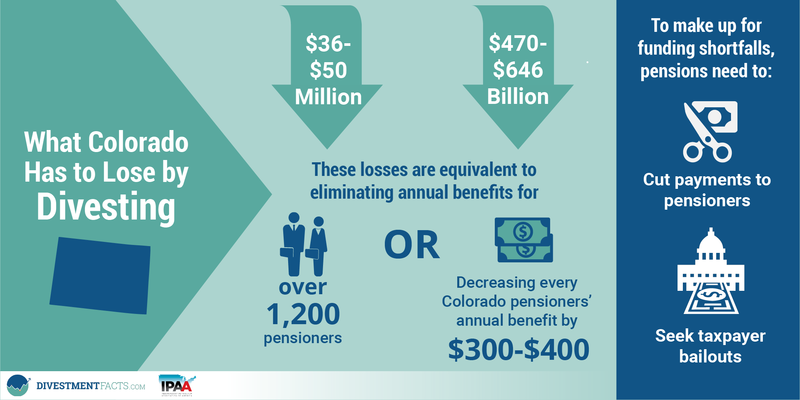 A $198 million loss due to divestment equals the yearly pension payments for 8,598 ERS retirees. Over 50 years, the costs of divestment for New York State add up to $1.1 trillion under the narrow approach and $1.5 trillion under the broad approach. 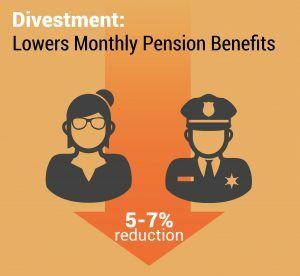 To make up for the substantial shortfall caused by divestment, the State will either have to lower pension payouts or seek new revenue from taxpayers. Read more below on the costs Prof. Fischel and his team found for other top U.S. pension funds across the country. A new report, authored by Prof. Daniel Fischel of the University of Chicago Law School, together with coauthors Christopher Fiore and Todd Kendall of the economic consulting firm Compass Lexecon, now puts a hard number on the real financial impact of divestment at 11 of the nation’s top pension funds, and the costs are staggering. Fischel’s report analyzes 11 of the nation’s top pension funds—including the largest state pension fund, the California Public Employees’ Retirement System (CalPERS) as well as municipal funds in New York City, Chicago and San Francisco to determine the financial impact of divesting. The results indicate that these funds would lose up to a combined $4.9 trillion over 50 years due to reduced portfolio diversification. The weighted average portfolio of the 11 funds would have lost 7.1 percent due to narrow divestment and 9.3 percent due to broader divestment (including utilities) over the past 50 years. 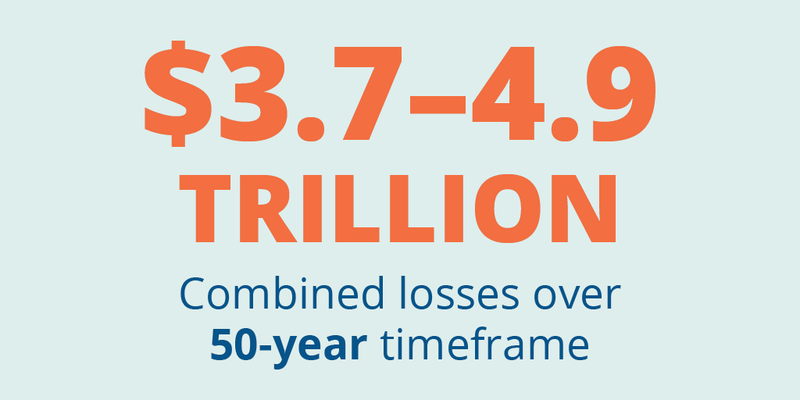 This translates to losses of $3.8 trillion in the narrow divestment approach, and $4.9 trillion in the broader divestment approach over the past 50 years for the group of 11 funds as a whole. A divestment policy would hit California’s CalPERS fund the hardest, with reductions in returns ranging from $2.3 to $3.1 trillion over 50 years, and up to $290 million annually. These dollar amounts represent money that would be made unavailable to pay out pension recipients, and as a consequence, pensions would either need to slash payments to pensioners or seek other sources of funds, such as taxpayer bailouts, to compensate for the losses brought on by divestment. To date, leading pensions from across the nation have said no to divestment activists who continue to push pension funds to divest from fossil fuels despite the impact such a decision may have on the retirees these funds support. This report is just one more piece of evidence why divestment is all cost and no gain for the people who rely on these funds. 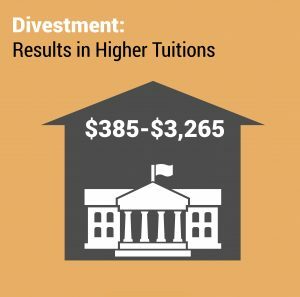 When schools decide to divest, the financial hit their endowments take is both significant and ongoing – having a very real impact on these institutions’ ability to support critical student, faculty and academic programs. Factor in all the losses incurred thanks to trading costs (1.65 percent), compliance costs (0.56 percent), and diversifications costs (0.23 percent), and the average endowment “hole” created by divestment results in a 15.2 percent drop in transfers from endowment accounts to school programs. That’s according to a new study authored by Prof. Hendrik Bessembinder of Arizona State’s Carey School of Business. What could a 15.2 percent annual reduction in endowment spending mean for the school, its students and its faculty? For pensions, a 5 to 7 percent reduction in monthly pension benefits for a typical pensioner. Focusing on a sample of 30 universities, including large, medium-sized, and small endowments, conservative estimates of these transaction costs range between 60 basis points and 269 basis points for large endowments, between 25 basis points and 180 basis points for medium endowments, and between nine basis points and 124 basis points for small endowments. Meanwhile, conservative estimates of ongoing annual compliance costs range between 8 basis points and 58 basis points. For a typical large endowment, this would translate into a loss in value of as much as $7.4 billion over 20 years. For medium and small endowments the loss is equal to between $52 million and $298 million, and $17 million and $89 million respectively. Since many endowments hold assets in mutual funds, commingled funds, and private equity funds, divestment generally requires the sale of an entire fund – not just its fossil fuel holdings. This imposes substantially larger transaction costs for endowments. Harvard, Yale, MIT, Columbia, and NY collectively could lose more than $195 million by divesting from fossil-fuel related equities – $195 million for each and every year the portfolios are active in the market. 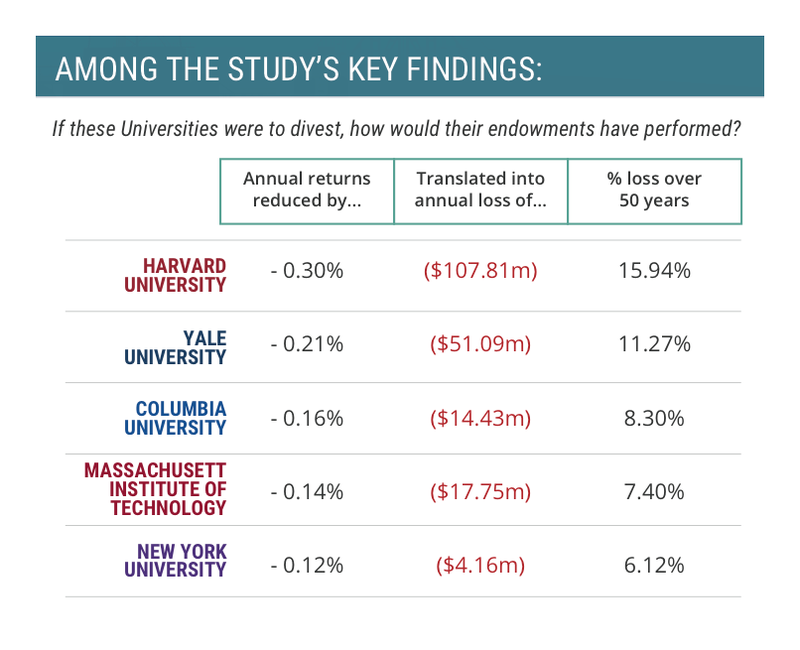 Harvard would experience the most significant loss if it decided to divest – roughly $107 million per year. 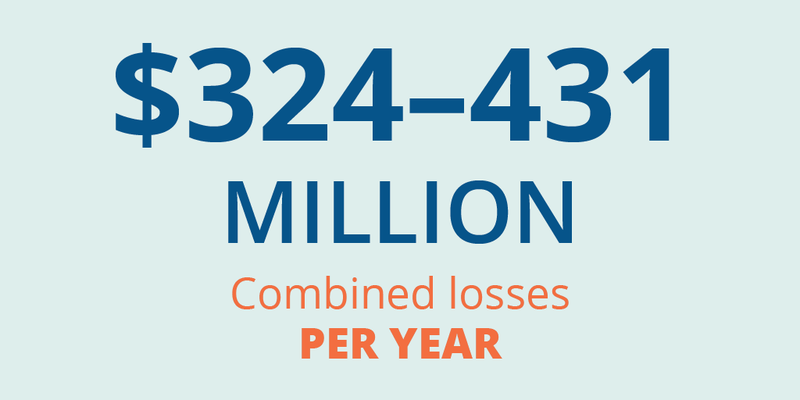 Yale’s losses are projected to exceed $51 million year per year. MIT would lose $17.75 million; Columbia would lose $14.43; and NYU would see a reduction of $4.16 million. Divestment almost always generates long-term investment shortfalls due to reduced diversification, and the shortfalls are typically substantial, given the size and importance of the energy sector being divested. Reductions in investment returns of these magnitudes would likely have a meaningful impact on universities’ ability to satisfy their institutional goals of research and education as endowments fund a material share of the operating budget for all five universities. 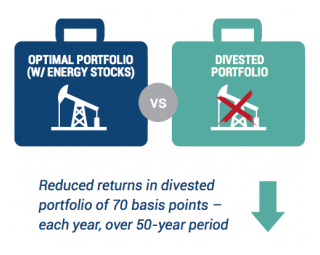 Portfolios divested of energy equities produced returns 0.7 percentage points lower than ones that invested in energy on an absolute basis, representing a 23 percent loss over 50 years. 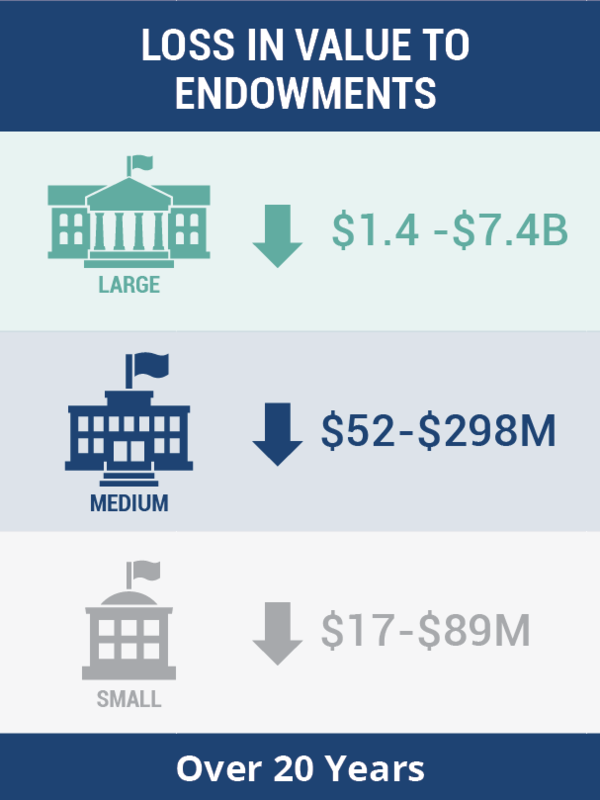 A decrease in portfolio performance of 0.7 percentage points on the roughly $456 billion that comprises total university endowment assets would decrease annual growth by nearly $3.2 billion each year. Management fees for complying with divestment polices are much higher than those charged by traditional funds. An increase in compliance costs of just one percent on the estimated $22 billion of those endowments invested in energy stocks would further decrease growth by an additional $220 million per year. There is no evidence of any discernable impact on the companies being targeted by divestment. Bottom line: The only entities punished by fossil-fuel divestment are the schools actually doing the divesting. Check out the full reportand fact sheet from Professor Fischel, and visit the What They’re Saying page for more information on why institutions are saying no to this flawed campaign.